In his 16-year racing career Rueben McMurter became a forceful presence on the road race circuits of North America. “The Rueb” amassed more than 50 first-place finishes in professional racing. He raced in the first-ever world superbike event at Donington Park in England in 1988 and placed a brilliant second overall in the 1989 world superbike round at Mosport behind world champion Fred Merkel. Success had its cost and Rueben suffered his share of injuries, but as he says, “I always pushed hard. I was out there to win.” Win he did, gaining 14 Canadian national road race championships, including 10 Canadian superbike titles. He had a string of top-10 finishes in the Daytona 200 and was a member of the North American team in the match race series against England from 1986 to ’88. His debut as a road racer was almost accidental. Growing up in Sarnia, Ont., Rueben rode a Kawasaki Z-1 and was “kind of wild on the street.” In 1976 he had never been to a motorcycle race before when his friends Bill Hornblower and Steve Pierce suggested he accompany them to an event at Nelson Ledges, Ohio. His bike was loaded in their van and rudimentary race preparation done while they were driving to the track. As a novice, Rueben received a 10-minute chalk talk after the rider’s meeting and was then set loose to race in the open production class. In the final, he was lapped by Lang Hindle but decided to try and match the star’s pace until the rain fell and then so did he. Rueben admired Lang’s fabricating skills as much as his riding expertise, since his father owned a structural steel business and could do just about anything with metal, “a bit like Lang.” Having his father’s encouragement helped give Rueben’s early racing a boost, and Hindle became his role model. The Rueb lined up for his second race ever at Mosport, also in 1976, but it ended early when he was pitched into the wire catch fence at the bottom of Corner 2 and suffered a punctured lung. The track in those days had a far more hazardous perimeter for motorcycle racers than it does today. Rueben came back the following year and scored a string of first-place finishes at Nelson Ledges to take the open modified production series championship. 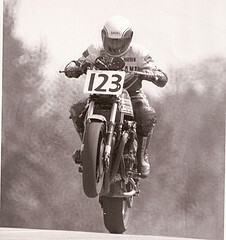 After a year’s layoff from racing, he was Canadian Motorcycle Association rookie of the year in 1979 and advanced to pro level mid-season. From then on Rueben raced just about everywhere he could, starting at Daytona and progressing through other AMA races at Talladega, Elkhart Lake, Charlotte and Road Atlanta. On the Canadian side he placed second overall in the open class of the RACE series as well as the CMA superbike championship. The following year, 1981, was even better, with a string of firsts and seconds that garnered him the RACE series national superbike championship despite a broken kneecap and wrist at Mosport mid-season. The remainder of the ‘80s brought podium finishes almost beyond counting and culminated in the FIM world championship round at Mosport in 1989. Rueben forced his Honda RC30 past the world champion on a similar but factory-supported machine when Merkel’s battered tires let go on the last corner of the last lap of the second race. With Italian madman Giancarlo Falappa well ahead and the American struggling for control, Rueben took evasive action and forced through to lead Merkel by inches at the finish and gain an overall second for the day. It was one of his finest rides.